Kitty's orzo salad is packed full of a long grocery list of secret ingredients revealed here for the first time. It is a happy day for my friends and followers of this recipe column (not necessarily one and the same) when Kitty comes to town. It is an even happier day for me when she is staying at my house, thus making it super easy for me to document every move she makes in the kitchen. My neck may have a permanent groove from wearing my camera 24⁄7, but it is worth it to record her culinary marvels. For our first Kitty offering (and there will be more! 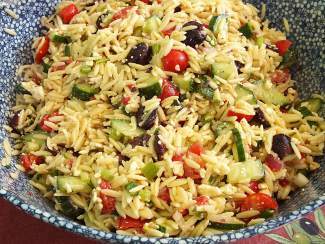 ), I would like to introduce you to her Orzo pasta salad. What I love about this dish is, despite its pasta base, it is light and refreshing, full of summer fresh ingredients and not bogged down with a mayonnaise or a heavy oil dressing. The ripe cherry tomatoes give it a sweetness that works so much better than the sun-dried tomatoes usually paired with feta cheese. Of course what is best about this potluck stunner is I didn’t have to make it and, as Kitty is here for another week, it is an exciting indication of what is to come. Can you say Thai pork tenderloin salad? Toss cooled orzo with olive oil, lemon juice, mint and oregano. Add feta cheese and toss again. Now toss in olives, red peppers, tomatoes, both onions and cucumber. Let sit for about an hour for flavors to blend. Add salt and pepper and your store-bought dressing to taste. Chill in refrigerator for a couple of hours before serving.